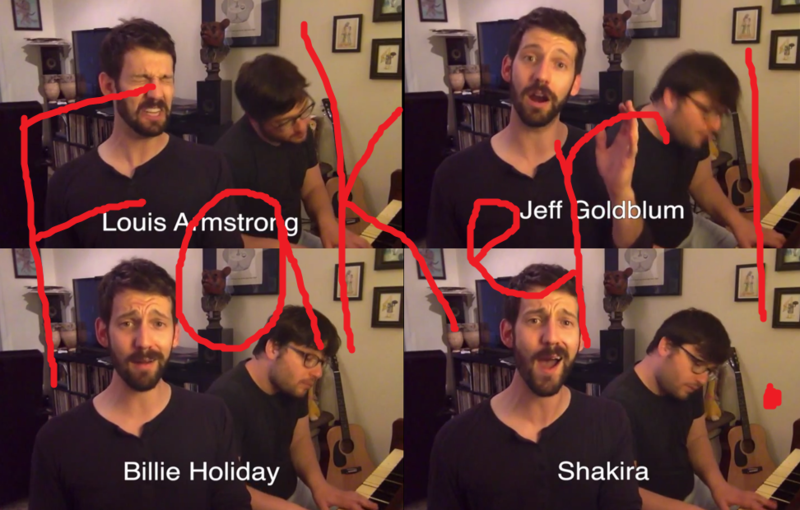 This Michigan-bred musician did zero out of 29 celebrity impressions. I was punked. Two weeks ago, I was making a rare visit to our Ann Arbor office (I live in Grand Rapids), and I stumbled across a video I thought would be great for our website. The video featured a singer named Rob Cantor as he performed – or at least claimed to perform – 29 celebrity impressions in one song. And they were good impressions, crazy good. I know of Rob Cantor because I am a fan of Tally Hall, a band he formed with some classmates at the University of Michigan about a decade ago. And, since there was a Michigan connection, I thought it made sense to share Cantor's new video here on michiganradio.org. "Hey Mark," I said, turning to our web editor Mark Brush. "Want some fluff?" At that time, Cantor's video had only a few hundred views on YouTube. Since then, the video shot up to more than 6 million views. Thousands of you saw it because of my post. This afternoon, Rob Cantor posted the truth about the video on twitter. In retrospect, of course, it seems like I should have known the video was a fake. For one thing, I work in radio. I edit audio every day. And while I'm clearly not as talented as Cantor and his crew, I know – or at least should know – what's possible. Well, robpollard (if that even IS your real name), you were right. And I totally missed it.